I've come to realize that people are cheap - especially when it comes to mobile phones. When you really break it down, your cell phone is probably the last thing you want to skimp on. To help get over those pre-purchase jitters, I've compiled a list of 7 things to consider when buying a new cell phone. When you purchase a phone from a wireless carrier like AT&T or Verizon Wireless, you'll likely be locked into a contract term of one, two or even three years (common in Canada). It's how they justify offering you the phone at a discounted rate. Keep that time frame in mind when making your purchase. The phone you really want may cost an extra $50, but spread out over two years, it's really not as bad as it seems. Shouldn't you be happy with your long-term commitment? Do you use your phone on a daily basis? Is it your primary phone line? Do you take it with you wherever you go? We often don't realize how much we rely on our mobile phones until they break or die on us. If you've got your cell strapped to you most of the time, you probably want to consider paying more for a better quality phone. "I don't need all that" is a phrase I commonly hear from people who are looking to buy a new phone - but let's be realistic. Do you text message a lot? If so, why wouldn't you pay a little extra and go for that phone with the full QWERTY keyboard? Do you like to browse the web? If so, you may want to pop for the phone with a really good web browser. If you're paying for services like text messaging and mobile web, shouldn't you enjoy the experience? Remember - two years, people! Do you want to be able to freely download applications and games onto your phone? It all comes down to the operating system. When in doubt, stick to smart phones or phones that are Java-enabled (J2ME) as they offer the largest selection of applications and games (both free and for purchase). If you buy a phone that runs on a proprietary operating system, such as Verizon's BREW-enabled interface, you're going to be locked into a limited software catalog in which you have to pay for almost any program you download. This is one instance in which a cheap phone can wind up costing you a lot in the long run. Believe it or not, a feature-rich phone can actually simplify your life - that is, if you get the right one. While smart phones are usually your best bet for syncing information with your computer or online services, there are plenty of standard feature phones (aka "dumb" phones) that also offer this functionality. A little research can go a long way. Imagine your calendar, alarm clock, address book, music, photos, and videos, all synced up, all in one place...your pocket! Check out How I Met My Blackberry for more insight. 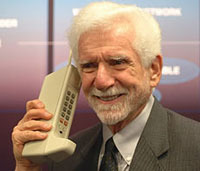 As I mentioned in #1, the cell phone you got for $49.99 when you signed your contract may actually retail for $399.99. What your cell phone provider may not explain is that if your phone is stolen or gets damaged beyond what's covered in the warranty, you may find yourself purchasing a replacement at retail value. That means if you accidentally drop that crappy little $25 Razr in a puddle, it could cost you $300 to replace! If you are clumsy or you tend to lose things, get insurance if your provider offers it. If it's lost, stolen, or demolished, you can get it replaced for a small deductible (usually about $50). Joe Says: Be good to yourself. Two years is a long time to be toting around a cracked phone with masking tape as a battery cover.